Deluxe Happy Birthday Package. Wow! What a fun gift. 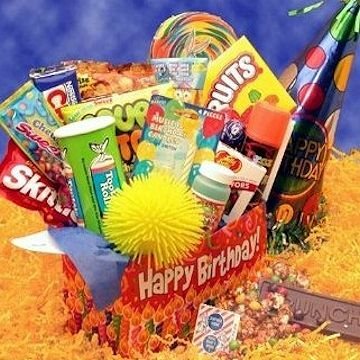 This Happy Birthday Gift Box contains classic candies and fun! This birthday surprise is sure to cure any sweet tooth! This gift includes the following: 5 oz Tootsie Roll Bank w/ Tootsie Rolls, musical birthday candles, fruit flavored candy bubbles, Silly String, Tootsie Pops, Jelly Belly assorted jelly beans,Skittles, Sweet Tarts, Sour Patch candies, Pez Candy Dispenser w/ 2 refills, Nestle Crunch bar, Rainbow Lollipop, Cracker Jacks, Fun ball (Assorted colors), and candy fruit snacks.